The U.S. Drought Monitor map released March 1, 2018, shows the location and intensity of drought in the southern Plains. 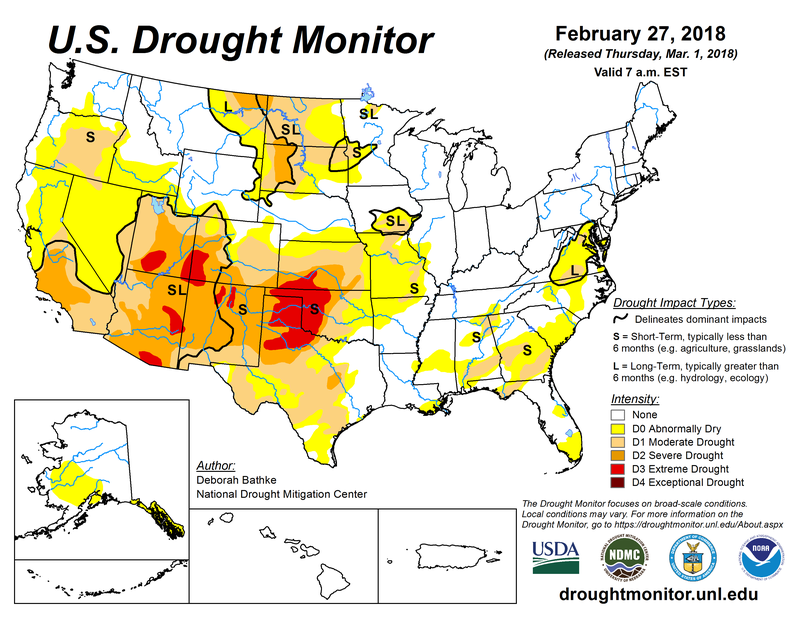 Responding to the severity of drought conditions across the southern High Plains, drought and climate experts are organizing a series of webinars on conditions, impacts and outlooks. The first will be March 16, 11-noon central time, featuring John Neilsen-Gammon, Texas state climatologist. He will focus on drought in Kansas, Colorado, Texas, New Mexico and Oklahoma, and will take questions at the end. This series of webinars is a collaboration between the American Association of State Climatologists -- specifically Texas, New Mexico, Oklahoma, Colorado and Kansas; the National Oceanic and Atmospheric Agency (National Weather Service, National Integrated Drought Information System, National Centers for Environmental Information, Southern Climate Impacts Planning Program); the National Drought Mitigation Center at the University of Nebraska-Lincoln; and the U.S. Department of Agriculture’s Southern Plains Climate Hub. The webinar will be recorded and made available following the presentation. A PDF file will also be available. For more information please contact Victor Murphy (victor.murphy@noaa.gov).